"Pin-up" shades are the best way I can think to describe these, although they're really hook-and-eye shades. We live in a little house, and most of the interior real estate is occupied by furniture, projects, or a dog who is everywhere at all times, so drapes just don't work for us. I've made these simple shades for years, since they neither add nor subtract anything from a room; they fit right inside the window frame - neutral, minimal, low-key. But lately my tastes have veered towards those of a well-appointed pensioner, and ... now I'm on toile. The other day I saw a gorgeous, faded-aqua toile online that I searched and searched for, only to find that it's exclusive to Pottery Barn, of all places. Instead of country maidens and men a-courting it's got big, broad leaves and little old mills - not that, if I'm being honest, I don't love the former. I found a gently-used king-sized duvet cover on eBay that offers about ten yards of fabric, and seam-ripped it into its basic components. These shades are super-easy. Just measure the inside of your window frame. Add 1" seam allowances to each of the sides and the top, and 3 inches to the bottom, for a nice, wide hem. Fold 1/2" creases onto the sides, then fold over and press again. Straight-stitch the hems. Once the sides are hemmed, repeat with the top and bottom, making a 1/2" hem at the top and a 1-1/2" hem at the bottom. Sew the eye portion of a hook-and-eye closure at the top corner of the panel if you'd like it to open to halfway, or at two-thirds the panel's height if you'd only like it to open a third, like mine. 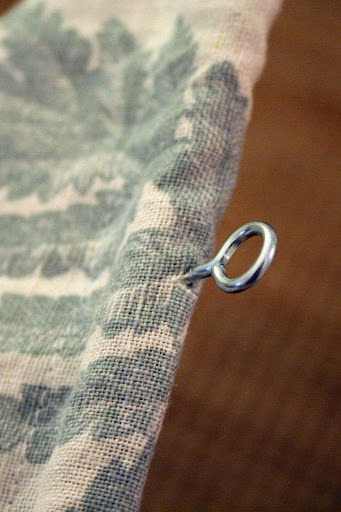 Sew the hook portion at the corner of the bottom hem, at the front with the hook facing out. Repeat at the other side. Buy a 1/4" wood dowel and a 1/8" wood dowel (under a dollar at the hardware store), and use a knife to score the 1/4" dowel at the right length, about 1/2" shorter than the width of your finished panel. Measure in several inches from each end, and use a very small screw to screw two shallow holes into the dowel, where marked. Slide the 1/4" dowel into the hem at the top of your panel, turning it so the holes are positioned at the top. Snip a tiny hole into the fabric above the hole, and screw in a small eye-hook. If you plan on making more than one shade, make sure to use the same dimensions on each one. Not doing so will create a huge hassle if you ever want to switch curtains around in your house. 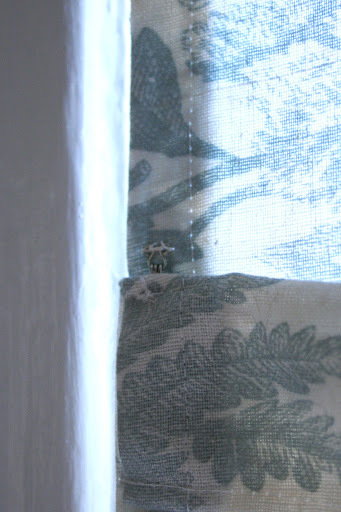 Screw in two hooks inside your window frame to correspond with the hooks on your panel, and hang the panel. Slide the 1/8" dowel into the bottom hem so the panel hangs neatly, up or down. How do people photograph shades? Shelter mags always have perfectly light-balanced spreads where you can see the pattern in the sofa, the details in the rug, the stripes on the curtains, and the hedges outside. How? Windows, taken from the inside, are backlit by nature. Since I don't work for Veranda, please excuse the ambiguous quality of these pictures. I love the photos, I love the blue, I love the toile. But still, my lasting impression was, "Wow, she bought something on eBay. That place that never occurs to me.." Teach me to buy online already! I owe the top-right picture to the good people at Adobe. Would it be okay if I featured this on my blog with a link back? Thanks, Sarah! I agree completely! And some quick advice - when you buy a fabric, try to find one with a little bit of body to it. This toile is lightweight but a little bit stiff. I've done this with soft, drapey fabrics, but stiff linens and cottons make it a bit easier to press and hold creases, and to straight-stitch without bunching. Question: Do you think this would work/look ok if the curtain was hung outside the window on a curtain rod? 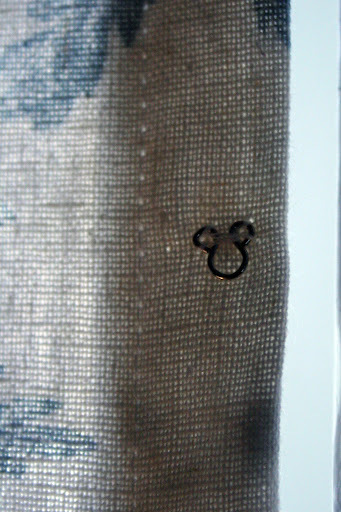 I need to make a little curtain for my son's room in our rental place and there is already a rod in place (holding up a very sad, sheer curtain that just won't cut the mustard this summer). I am definitely saving this for a future project in a future apartment or house. They look great and I love that it is something I can (try to) make myself. I think that would look fine! To hang these outside the window frame, I think I'd add a little length - maybe let it hang a foot past the windowsill. Anna, definitely give it a try! All it really is is hemming a rectangle. Oh! And for the bottom dowel, it really would be better to use a strip of plastic, or something that won't snap easily - but wood is all I had on hand. pardon me for being obnoxious...I kept wondering how you were going to use Velcro to hold up the shades since hook and loop is the generic term for Velcro. What you used are hooks and eyes. See, obnoxious. Sorry. I do love what you did though. A simple and elegant solution. You're not obnoxious; you're right! It's been duly changed. Lovely! I made something similar a few years ago with more "tiers" of hooks & eyes with a lightweight white cotton. Thanks! Here is a link for you. Those are so pretty! Definitely going to try to make some for my window. As for how they get such a balanced picture, they use flash. Expose the photo for the outside (the room will be dark) then use strategically placed flash to light the room so both are equally lit. absolutely brilliant! I've just moved into a small house and my curtain/shade budget is next to nil. These are not only brilliant but economical and versatile. I'm SO happy to have found your blog. Thanks go to Pinterest. This may sound a tiny bit odd, but you can actually do the same thing with magnets. Get the super freaky strong kind, tuck two or three in the corners and middle of the bottom hem, and then two or three in the corners and middle of the top hem. When you want to put them up, just click the magnets together. Totally fun and nearly invisible. You have solved my ongoing window shade problem once and for all--although I may fuse in a light weight lining. Still, this is the solution for us who like sewing but dislike lots of hardware! Huner, your post on those is hilarious. And magnets are a brilliant idea. Please forgive me for just not getting it, but how is it that the wrong side of the fabric would not be showing when you pull the hooks up to fasten in the eyes? The only way I can see to avoid that would be to have double panels sewn together, which you do not. I'm sure I'm missing something somewhere, but I've read this over and over and don't see it. I hope you'll help me with this, as I would really love to incorporate this curtain into my own home. I was just remembering another method of hanging a similar curtain, using two tension cafe rods. One goes in a casing at the top of the curtain and the other at the bottom, also in a casing. To raise the curtain, simply lift the rod to the desired level and reinsert into the window. Also, you can leave the bottom rod intact and lower the top rod! This works especially well with smaller windows that are easily accessible at the top. Naomi - You're not missing anything! You do see the wrong side of the fabric when you pin the shade up. As you can see from the other photos, the pattern on my fabric shows pretty clearly on the wrong side, and especially when sun is shining through - so you can pretty much always see the pattern on my shades, pinned or not. I don't mind the effect at all - but you do have to make sure your hems are neat. I hope you haven't been driven crazy by this post! And the tension rod idea is a good one, too. this is amazing! I'm so glad I found your blog. I've been looking for a cost-effective way to hide the venetian blinds in my new apartment and this is just the perfect solution! 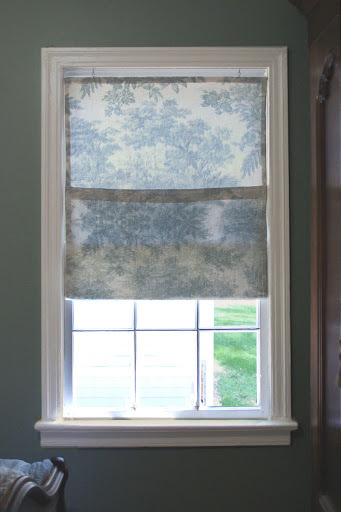 I am going to give this idea a try as I need light filtering shades for my 3-paneled window. I think this will do the trick...thanks so much! How smart.....you make it easy to follow...Definitely Try for my windows. Would it work to put the hook and eye on the back, so it wouldn't show? an alternative to mini blinds that my cat won't destroy! thank you! would like to appreciate your efforts that bring really nice work and also engage all people here to take opportunity for share their views. This is truly nice. Love the blind. I made similar ones but instead of using hook and eyes, I sewed a sleeve at the bottom. I slipped in a thin piece of wood (it was an old wooden ruler I cut to size) then I draped two piece of ribbon over the top of the blind. To open the blind to where I wanted it, I just rolled the bottom up and ties the ribbons around the blind. This let me decide whether I want lots of day light or just a little.